This is a bit different. 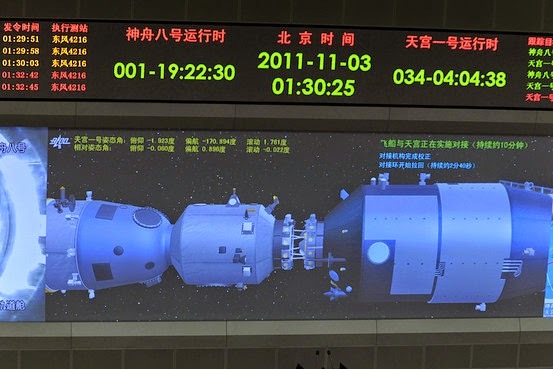 What we have here is, first, an animation above, the picture, of what the Chinese project to be their first space station project. They anticipate having it in orbit in 8 years, or by 2022. Below that is an animation from a lunar lander, the Chang’e-3 lunar lander, that the Chinese released. It shows the craft touching down on the lunar surface. That is the Chinese version, not the one they released to the outside world, and was intended for the home market. Getting it was not easy, incidentally, seeing as how I do not read Chinese. But, there it is. Marvelous stuff. While NASA goes of on mysterious expeditions like lassoing asteroids, the Chinese are quietly building the foundations for their own space presence. At this rate, they'll be back on the moon before the United States.